This pumpkin spice cake with cream cheese frosting is outstanding. You will also find an easy recipe for pumpkin dump cake and pumpkin spice mix below. So moist and delicious; a dream on a fork with the cream cheese frosting. Offering many pumpkin and apple dessert recipes at the end of the page. PREHEAT oven to 350 degrees and grease a 9x13 cake pan. In a large bowl, cream butter and sugar until light and fluffy. Add eggs, one at a time, beating well after each addition. Add pumpkin. Combine the flour, pie spice, baking powder, cinnamon, salt, baking soda and ginger; add to the creamed mixture alternately with buttermilk, beating well after each addition. Fill prepared cake pan. Bake at 350 degrees for 50-60 minutes or until a toothpick inserted in the center comes out clean. For frosting, in a large bowl, beat cream cheese and butter until fluffy. Add the powdered sugar, vanilla and cinnamon; beat until smooth. Frost cooled cake and refrigerate leftovers. 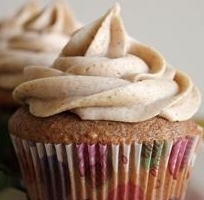 For cupcakes, fill tins 3/4 full, and bake for approximately 20 minutes. This recipe makes 24 large (not jumbo) cupcakes. Mix the first five ingredients together and pour into prepared cake pans. Sprinkle with the yellow cake mix and then the nuts. Drizzle with the melted butter. Bake for 50 minutes or until set in the center.